The luminous look of yellow will brighten up your boring brown packages and lifeless white envelopes! What you get with this selection is a cheery appearance combined with the classic houndstooth print. It's a stylish and optimistic finishing touch for all your outgoing mail. But the best thing about these labels is that they're self-adhesive. That means the only thing you need to do is peel and place. No licking and sticking. More importantly, no more hand cramps from writing out your name and address over and over again! 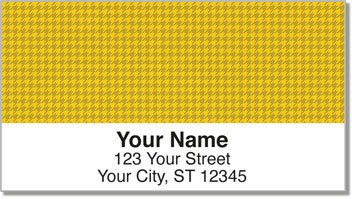 Get your very own Yellow Houndstooth Address Labels now! You'll also find three other shades and a multi-color option for those who like a little variety!